Space per pupil: 30 sq.ft. 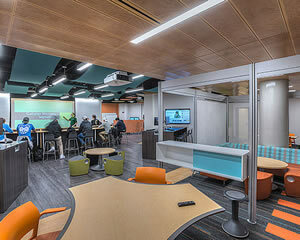 Collaboration at Michigan State University between three separate colleges and the school’s housing/dining group has resulted in a truly unique space for students. 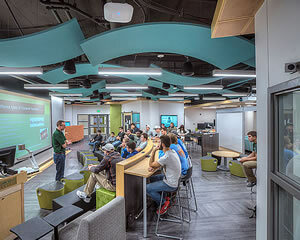 Called “The Hive at MSU,” the space is the product of a cooperative partnership between the Colleges of Engineering; Communication Arts and Sciences; and the Broad College of Business in collaboration with MSU Residential and Hospitality Services. These distinct parties came together to provide a student-based business incubator environment in a formerly underutilized space within the Wilson Hall dormitory. A fast track project that began in earnest on November 1, 2013, The Hive was designed and built even as the curriculum for the space was being developed by the three colleges in a parallel effort. 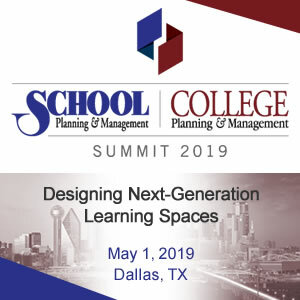 Designers had to anticipate what that curriculum would be – and provide an adaptable framework for the developing program. The design team was asked to participate in faculty and University brainstorming sessions for The Hive before design was complete, which was an invaluable experience – designers could see and hear the wide range of aspirations for the space which became important in shaping the solution. The Hive is equipped with state of the art technology and a layout that encourages team building and idea development. This “creative commons” is intended to connect students of different disciplines to produce ideas, and to ultimately support university and community entrepreneurial opportunities. The Hive includes a collage of inspirational and useful spaces to accommodate these various disciplines and users. Hive-based courses such as Business 201: Introduction to Business Model Generation allow students exclusive access to the space, as well as onsite mentoring from faculty and external professionals. 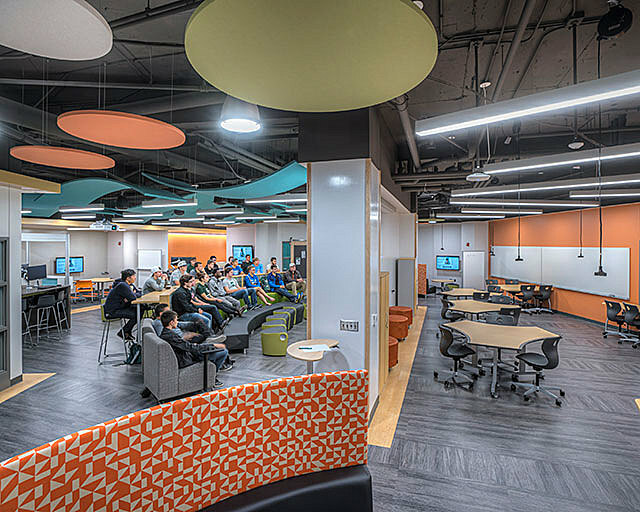 The dynamic “idea laboratory” is located in the heart of the Wilson Hall dormitory, a facility with two residential towers, a wing with an auditorium, and a center core with classrooms. The Hive is located in the busy central core where three main corridors come together. 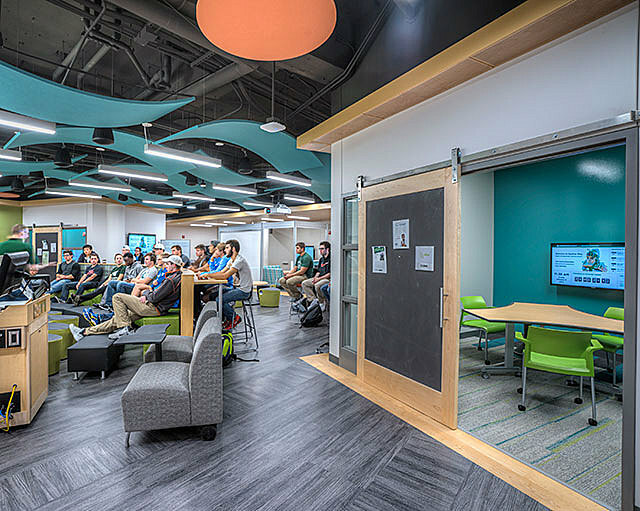 Designers absorbed space previously occupied by a convenience store and an inactive food prep area to create the new learning lab, and responded to the University’s request for a relationship between The Hive and the adjacent classrooms, which were renovated as part of this project. The Hive boasts 90 percent writable and display surfaces; open and private work areas; flexible collaboration and presentation areas, as well as personal locking storage. A custom semi-circular tiered seating and counter area provide a perfect spot for a larger gathering or presentations and includes a large writable surface/projectable wall. Semi-private breakout areas also include writable surfaces and technology spots. A larger Maker Space features flexible seating and work surfaces with drop-down power cords for charging, ample storage and additional writable surfaces. Semi-private Small Group Rooms include flat screen wall-mounted monitors, flexible seating and a sliding door when privacy or quiet time is required. A glassy garage door in the Large Group Seminar Room allows views into the space, and allows users to open the door to the corridor — thereby giving Residential and Hospitality Services the opportunity to use the area for dorm functions such as check-in or other gatherings. 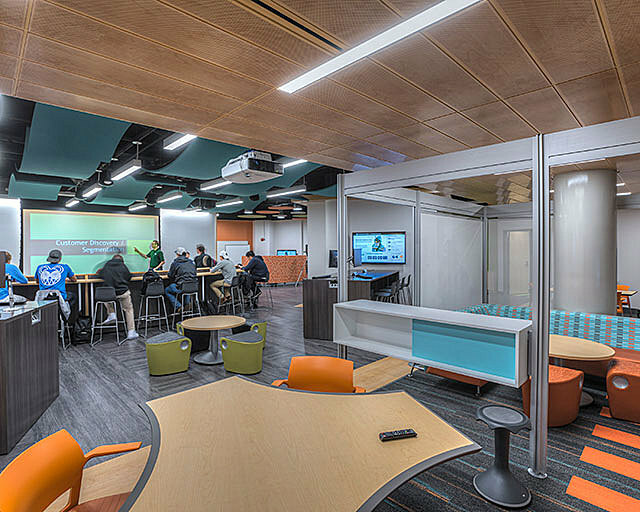 Two Small Group Rooms provide a private option for group collaborative activities or for one-on-one mentoring opportunities from the business community. Barn doors provide privacy and tackable surfaces. 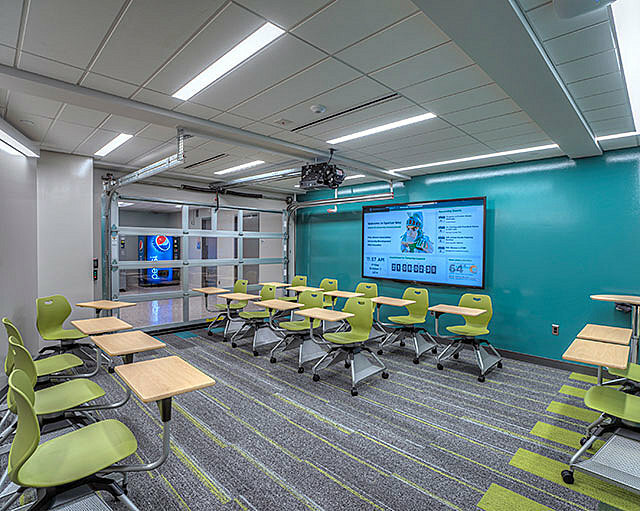 Completed on August 1, 2014 in time for the 2014-2015 school year, The Hive offers unique furniture and equipment for its users: tack-able sliding doors in break-out rooms for idea pin-ups and informal signage; a mobile riser unit with integrated power that facilitates an intimate presentation experience; pull-down cord reels in the ceiling of the maker space, and digital lockers for transient use. Mobile whiteboards and high-backed lounge pieces offer efficient space dividers, and other seating options support a multitude of collaborative postures to sit, to stand, to lounge and even rock — with small “rocking stools” that allow for focused movement. Walls that are not technology-enhanced are activated with markerboard paint, markerboard wall coverings or traditional markerboards. Markerboard paint is featured on a Hive Calendar at the entry for sharing events and ideas. A picture-hanging artwork system and space for 3d printers is also included. Technology was designed by University IT Services and includes multiple wall-mounted flat panels, a projector and a recessed projection screen. The construction method was standard stud wall with hollow metal frames and borrowed lites that allow passersby to see inside. Luxury Vinyl Planks and carpet tile flooring; exposed ceiling construction and “clouds” of wood ceiling tiles were also included. Dense and highly flexible power distribution allows for maximum adaptability to power needs, as well as dynamic and energy-efficient LED light fixtures. Mechanical design included a cost-effective variable air volume air handling unit (AHU) with demand control ventilation that conserves energy when spaces are not in use.